A sweet and nourishing La Ba congee 腊八粥 to usher in the new year! Next Tuesday – 11 January – is the eighth day of the last month of the year according to the Chinese lunar calendar. In this day, which is roughly 3 weeks after the winter solstice, many Chinese celebrate the “La Ba” (腊八) festival by making a congee historically known as “La Ba Cha” (腊八茶) or “La Ba” congee. The character 八 (“ba”) simply means the number “8”, and the character 腊 (“la”) is typically associated with the twelfth lunar calendar month and all sorts of cured meats that the ancient Chinese made from the animals they hunted during the winter. These cured meats supplemented their staple foods but were also used as ritual offerings to dead ancestors and demi-gods as a way of expressing gratitude for bumper harvests and hope for a safe, secure and prosperous year ahead. Many older Chinese people typically see this ritual as effectively the end of one year and the start of the next. 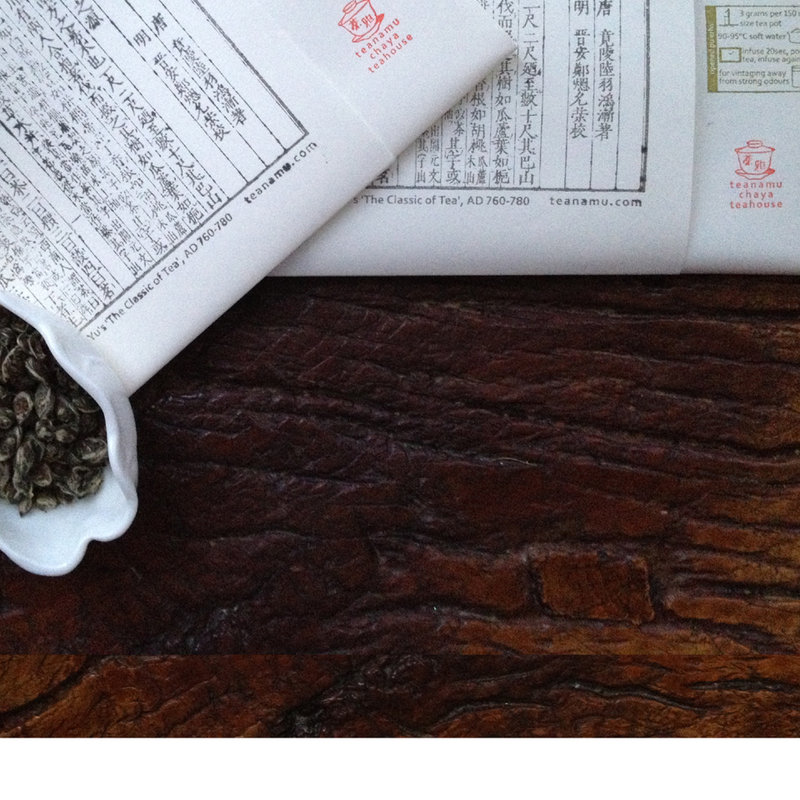 Like Eight Treasures Tea, La Ba Congee is made with eight different types of ingredient (some regions used up to 20). These would mainly be pulses, beans and dried fruits if you’re making a sweet dessert or meats, mushrooms and other vegetables if you’re after something more savoury. The ingredients also vary from region to region. Korean dish Ba Bao Eight Treasures rice eaten around the festival of La Ba. 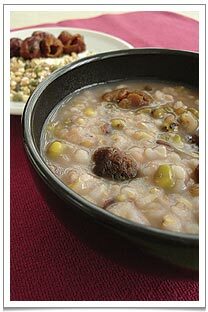 In ancient times the predominant components of La Ba Congee were red mung beans, rice and glutinous rice but nowadays the list can include Chinese dates, chestnuts, peanuts, gingko nuts, lily bulbs, longan fruit, walnuts, almonds, pine nuts, barley, sultanas, soya beans, black beans and even rose petals! Traditionally, on the evening of the 7th day in the 12th month, families start to prepare the La Ba Cha ingredients by soaking or de-shelling. Then at the stroke of midnight, they start to slowly simmer the ingredients till the next morning. At one time this would have been happening even in the Imperial Palace! The congee is first offered to the ancestors in the underworld, then it’s given to friends and families or donated to charity before noon, and only if there is anything leftover after that – which I reckon there usually is! – can the family sit down to enjoy it. Some families also make lion or other animal ‘engravings’ out of fruit to decorate the congee. Many would deliberately save some extra so has to have some ‘remainder’ (which represents ‘profit’ i.e. ‘prosperity’) in the new year. 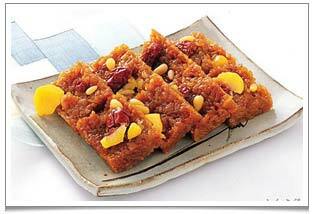 Setting the sugar aside, this is a nutritious dish excellent for the cold winter season. The various ingredients in La Ba Cha can nourish the spleen, enhance qi energy, clear the lungs and eyes and has calming, restorative effects. In Korea, a similar nourishing, rustic, rice dish is prepared and served at around the same tome of year. The Korean version is a pretty dessert based on steamed glutinous rice dotted with chestnuts, pine nuts, dates and a hint of cinnamon. To balance the slight heaviness of these La Ba dishes why not make a strong brew of a dark oolong, pu erh or Eight Treasures Tea as the perfect accompaniment? – Gently wash the seeds and grains. – Add all the ingredients in a claypot. – Bring to a boil and simmer for 1 hour until grains are cooked. Stir occasionally to make sure it does not stick and burn to bottom of the pot. – Cover the soy beans in water and boil for an hour to make the stock. – Wash the rice and Put into a claypot together with the soy bean, the stock and the rest of the ingredients. Add enough water to cover. – Cook for about 30-40 minutes before adding salt to taste. Stir occasionally to make sure it does not stick and burn to bottom of the pot. – Serve piping hot on a cold winter’s night!